Bizarre In-Game CS: Global Offensive Whiteboard Surfaces: Indicates An August 2012 Release Date For CS:GO, And More Weird Half-Life And Number 3 References – Could Doctor Breen Still Be Alive? Deep within the VPK caches inside the CS:GO beta’s files lies a cornucopia of currently unused files for CS:GO’s levels. Data-miners like Cnnoi, have managed to find files for CS_Office, and, supposedly, some have even managed to get CS_Office working within the beta. Some files are missing, but the majority of the textures and models are present. Including two very interesting texture files for in-game office whiteboards. What do they contain? Well, we won’t spoil the surprise just yet. Uh… unless you read the title, in which case we did. Just forget the title ever existed, and let’s get on with it. Let’s start with the first one, of course. Aside from the hilarious “Restrain Fans” joke, what else do you see? A little “PERPS TASED” table (using tally marks, or hash marks, if you prefer), which you might recognize as a reference to one of Barney’s more amusing quotes from HL2: “I’m way behind on my beating quota”. Notice how Gordon has tased precisely 3 perps. You think Valve would realize using this number isn’t exactly inconspicuous regardless of what they use it for. But what I found really interesting? Let’s take a look at Eli and Breen. Eli is crossed out in red, because he’s dead. But Breen, who died almost 8 years ago in Half-Life 2? He isn’t crossed out. At all. That seems a bit strange, doesn’t it? Could Breen have survived? To be fair, we never did see his body, and since the G-Man has proven he is capable of getting a person out of harm’s way, and since Breen does know who the G-Man is, it makes sense that the G-Man would want to have a little chat with Breen. Perhaps he got him out. Valve wouldn’t have crossed out Eli’s name, but somehow forgotten to cross out Breen. It makes no sense, and it has to have been intentional. But, hold on, and wait a minute here. Hidden in the background is a sort of drawing of what seems to be a police officer named Carl, attempting to hit the broad side of a barn, and failing. Can you see it? If you can’t, don’t worry. These enhanced… versions of the whiteboard will help. Interestingly, there are only 3 shell casings on the wall. I’m sure we can all agree that a higher number would have made the drawing funnier, but Valve instead went with the number 3. Interesting, to say the least. Then, towards the right, we’ve got a series of tally marks. Again, mysteriously, the only tally mark that is not a five-bar represents the number 3. Right under these tally marks is a date. 17th June, 2010. The last day of E3 2010. To the bottom-right, we have a series of bug-related statistics. Interestingly, it states that only 3 bugs have been fixed. And directly above that, we have a graph, putting hours of tester sleep up against the number of reported bugs. As we can see, the less sleep testers get, the more bugs are reported. But what’s interesting is that it looks a little bit like a Lambda. And just like the Half-Life logo, it’s surrounded by a circle. Let’s look at an enhanced version of the image. As you can see, it does resemble the Half-Life logo quite a bit. But that “reported bugs” line, pointing towards “10k+”, does seem a bit out of place, doesn’t it? Actually, take a closer look at it. It seems to point towards the spot where the number 2 is on the Half-Life 2 logo. This enhanced version of the whiteboard has also revealed a drawing of a bespectacled male just to the left of “TESTER SLEEP”. Looks a bit like Gordon, doesn’t he? He’s even got what looks like a beard, but it’s a bit hard to tell. Well… what can I say? It’s intriguing, I suppose. You can debate all you want about the graph, or about the number 3 references all over the place, but what you can’t toss out is the fact that a character we thought was dead, now appears to be alive and well. Believe it or not, this little tidbit is actually of very high importance to the Half-Life plot. I’m glad to see Valve has decided to throw us a bone. One that might keep us speculating for a while. 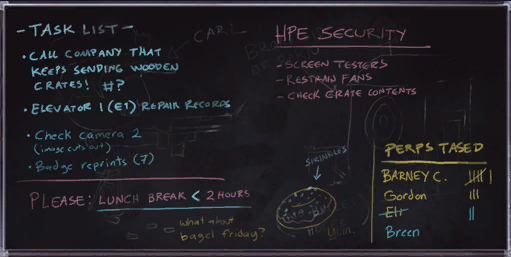 Credit to ProgSys for creating enhanced versions of the whiteboard images, and posting them in the forum thread where discovery and speculation first popped up. 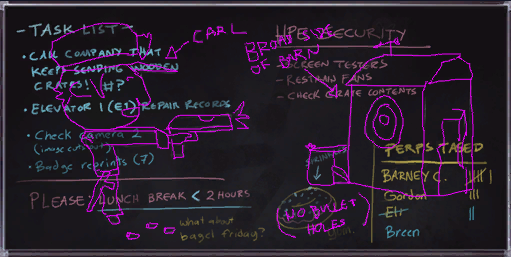 And credit to Zilchonum, for creating a clearer version of the image showing the Carl drawing, which he posted in a Reddit thread on the subject. Im not sure if this is artists laughing at us again or real small tidbits of information. If it’s the latter, I think its time to stop complaining. Valve are giving us clues about the game. Yea, Breen is red, so he was already dead at the time of writing, then Eli died and he got the red scratch. And I bet there are artist working at Valve that put this stuff in there just so fan-boys like us can find it, freak out, and assume it’s far more than it really is. Yeah, but Eli’s been dead for nearly 5 years. Both of them should be crossed out. Assuming that this image was created five years ago. Another possibility is that CS:GO has been in development, in some fashion, since before Ep. 2. But I still say it’s just a guy that works for Valve and likes to troll the fan base. No, CS:GO has only been in development since early 2010. The image was most certainly not created five years ago. I made that logo my wallpaper with a little photoshop. I thought it would just be more recyled source stuff, but this is very legit to me. Breens name being in red, algo may imply the possibility of him becoming one with the combines, wich was exactly what gordon was trying to stop back in the half-life 2 end. Eli’s name is crossed out, while Breen’s isn’t. I was under the impression that Breen was dead, am I wrong in thinking that he died or does he come back to life? You never see him die. He was in a force-field. It dropped very slowly when the teleport failed. If he was supposed to come back, Robert Culp’s death may have had an effect on the plot. It is believed that Breen died, yes, but we never did see him die, and this whiteboard clearly hints that he survived. He has red name, like the strike like on Eli’s name. Breen maybe coming back would be awesome, but to bad about his brilliant voice actor, RIP. Well unless his now one of the Advisors or transformed into some kind of alien ect, that could work. This stuff is probably Hidden Path Entertainment’s work rather than Valve’s. Dont forget Barney Eli Gordon and Breen were colleagues back then. I bet thats a reference to Mann co. actually, of TF2 wich delivers the infamous item crates. My god… i send thes info to the Valve ARG hotline last week. That’s cool and all… but this isn’t actually an ARG. I know, but did it anyway as a mean to spread the information. Icould just posted a comment here or on SPUF, though. To be honest, i didnt know what was i doing. My tinfoil hat never comes off. Do remember that Breen’s name is ENTIRELY in red, the same colour used to cross out eli’s. Breen is a villain, so obviously, his name will be written in red. 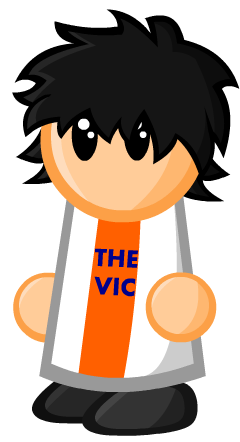 Tinfoil hat time, great summary Vic. I’m surprised these haven’t been found earlier. Valve is certainly playing with people I suppose. Still nothing concrete yet. I forgot to mention too, that in raising the bar Breen’s ultimate goal is to become one with the combine, sort of take on an advisor role so I wouldn’t be surprised if we see him in a sort of Advisor model with no legs etc. I can’t really find it but there is an excellent photo in raising the bar with breen as half human half advisor. Heh, sorry! By the way, I believe we actually played the CS:GO beta together earlier today.